Can you squeeze all the glue out of a joint? "Be careful you don't squeeze all the glue out of the joint" is something I have heard from time to time. I have always been sceptical as to whether that's even possible, so I figured the best way to debunk that would be to put it to the test. 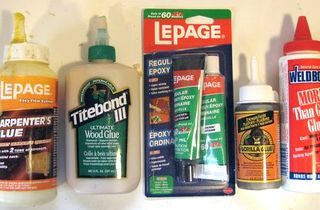 And while I'm at it, I figured I'd explore some other aspects of gluing. I used LePage carpenter's glue for all my tests (plain old yellow PVA glue), just because that's the glue I use the most. 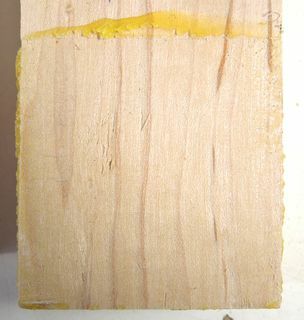 All my test joints were 4cm x 4 cm cross-grain hard maple on hard maple. I used hard maple because it's a very consistent closed grain domestic hardwood. It's hard and strong, so hopefully, I'd be testing the strength of the glue, not the wood. At left, squeezing the living daylights out of a glue joint in an attempt to squeeze all the glue out of the joint. As an opposite to the excessive clamping, I clamped most of the other joints using only a ten pound weight as a clamp. 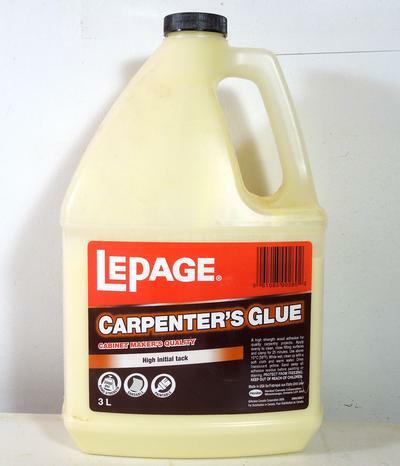 Another property I was curious about was whether this glue was any good at gap filling. So I glued several joints with thin plastic spacers (0.012" or 0.3 mm) on the corners so that there was a thick layer of glue between the two pieces. 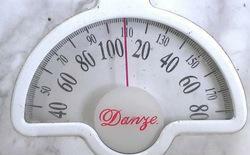 I applied light clamping force with a weight, in this case, I'm using a really large bolt as the weight. I made three of these joints, two with smooth scraped surfaces, one with sanded surfaces. I also heard people say that the glue would not stick very well to surfaces that are too smooth, so I prepared some of my surfaces by scraping them with a cabinet scraper. 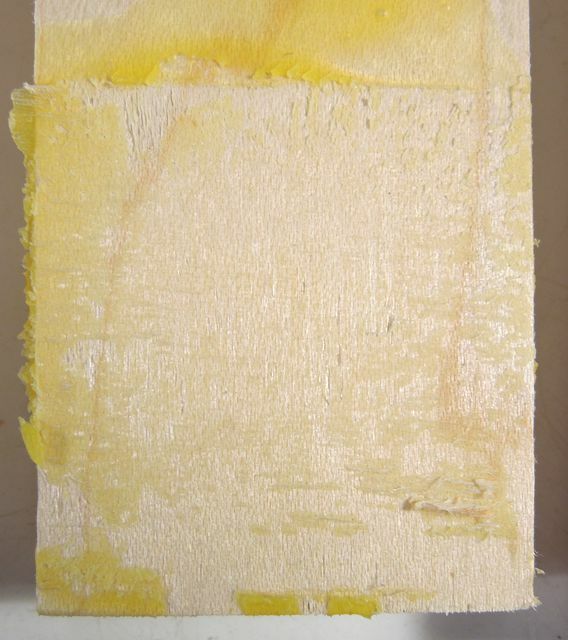 The joint surfaces in the remaining tests were sanded with 80 grit sandpaper. Some furniture makers only put glue into the mortises, then slide a dry tenon into the mortises. 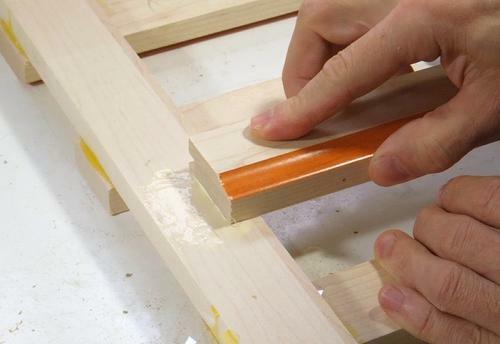 That way, the glue only gets pushed into the mortise, with no glue getting scraped off the tenon and squeezing out. 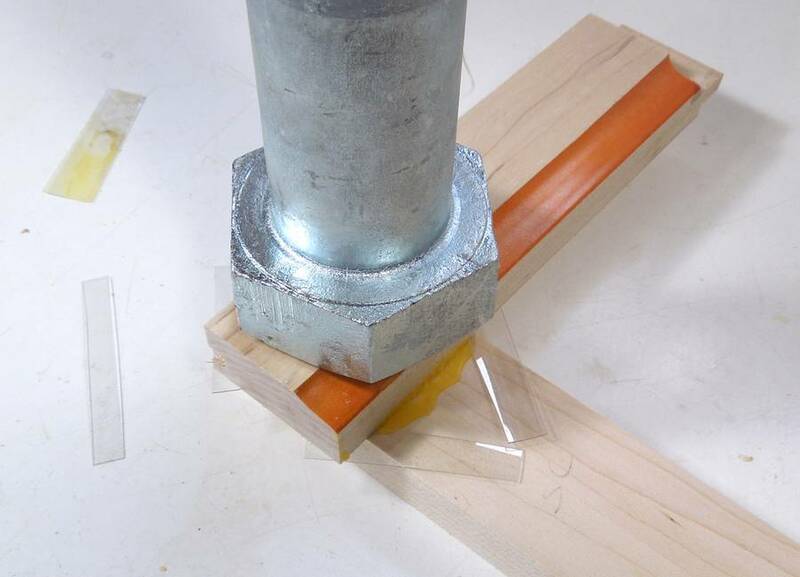 I was always wondering if that would form a good glue joint. 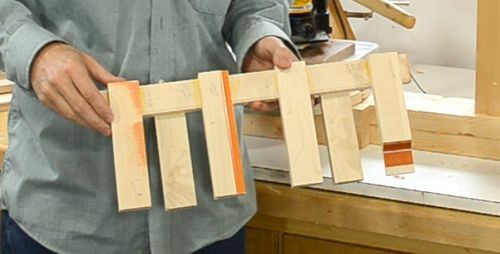 To simulate this method, I glued a few joints with glue only applied to the rail, then sliding the other piece onto it and clamping it. Think of the long rail with the glue on it being the side of the mortise, and sliding the dry piece onto it, pretending to be the tenon. 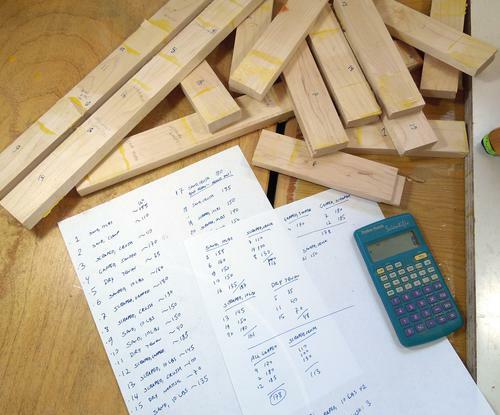 Overall, it took quite a bit of time to prepare the samples. 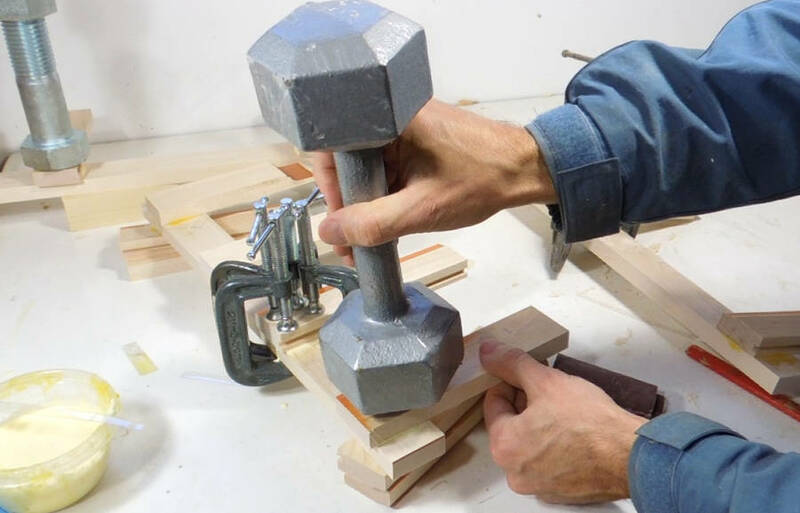 With many cross pieces glued onto a rail, and most samples only clamped with a weight, I had to wait for the joints to dry before I could add more. I also wanted to make sure every joint had at least 48 hours to dry before I tested them. I made over 20 joints. 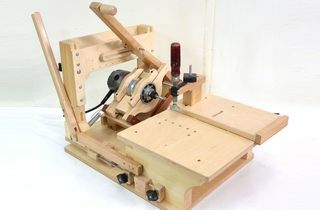 My testing apparatus is the same one I that I used for my earlier joint strength and glue strength tests. 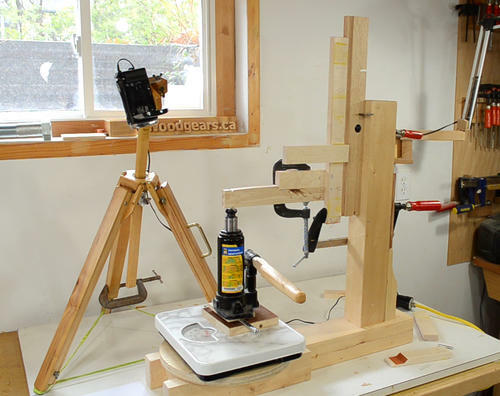 Basically, a very solid L-shaped frame, with a small bottle jack on a bathroom scale to apply a measured amount of force. 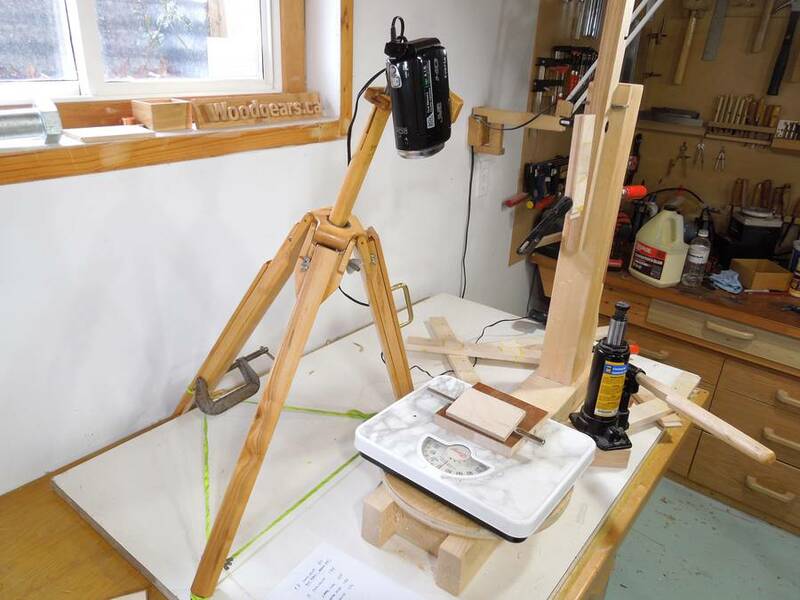 The test piece is clamped to the post of my L.
A video camera records the scale (for review, in case I miss the maximum reading). The video camera is mounted on one of my wooden tripods. My wooden tripods were the only ones to give me the flexibility I needed. The camera has to be looking down backwards so that the scale is right-way-up, and, more importantly, so that the flip-out screen flips out towards me. I expected the "dry tenon" type joint to do worse than average, but I was surprised by how much worse it did. The dry tenons broke with an average force of 48 pounds, less than one third the force that most of the other joints broke at. I think it's safe to say that the "no squeezeout" trick of only putting glue in the mortise doesn't make for a strong joint. 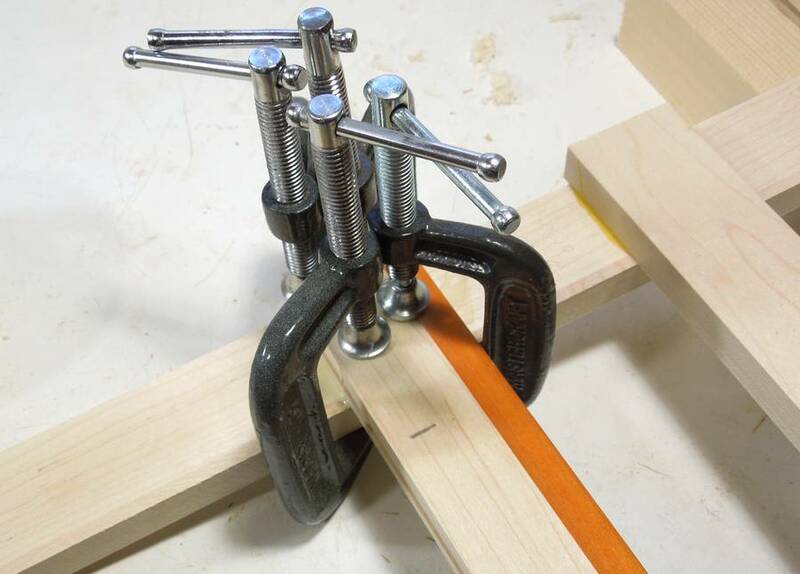 Clamping the joint excessively hard in an attempt to squeeze all the glue out of it was also detrimental to joint strength, especially if the glue surfaces were very smooth wood. 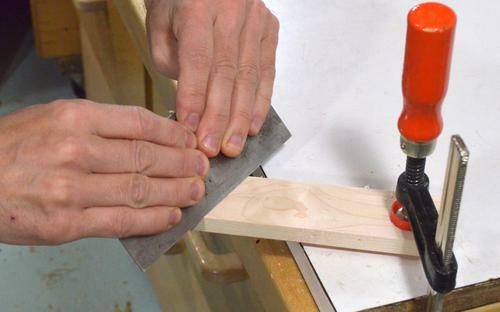 However, scraping, if anything, resulted in a stronger joint when only lightly clamped. Given sample variations and the small difference, I can't say with absolute certainty that scraping the wood made the joints stronger, but I think it's safe to say that it didn't weaken them significantly. A big surprise was that the gapped joints (with the 0.3 mm layer of glue) were the strongest joints of all! I'm still puzzling over that one a bit. I "masked off" the very corners of the joint with my spacers, and that may have helped the joint. I'm assuming the crack that breaks the joint always starts in the corner (where shear stress is greatest), and to have those not part of the joint might have been helpful, similar to how a relief cut in a machining context can actually make the part stronger. Another possible explanation is that I used so much extra glue, that the squeezeout from gluing may have added some joint area. Or maybe all that extra moisture made for a slower drying joint, which might be better. Regardless of what effects account for the difference, I think it's safe to say that a joint with a bit of a gap in it, filled with glue, can be just as strong, if not stronger than a tight joint. 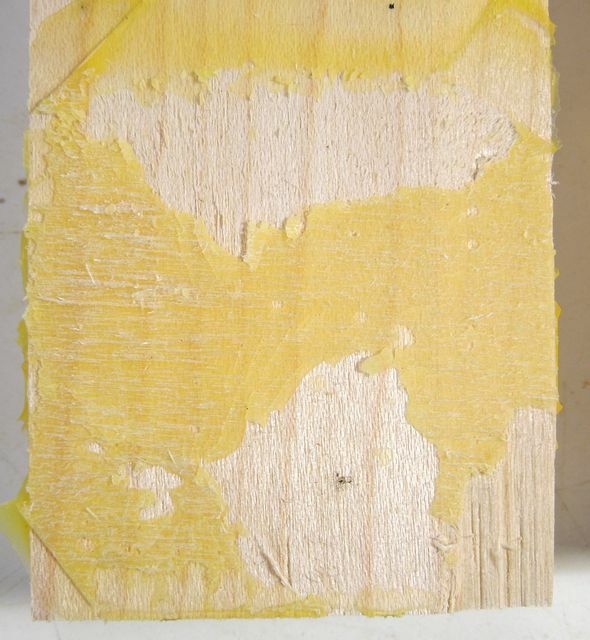 That said, the drying glue does shrink a little bit, and large amounts of glue take much longer to dry, so it's unadvisable to deliberately make joints with large gaps in them. Gaps in a joint, as long as they are filled with glue, do not aversely affect joint strength.